The Eureka Strings are quartet of sisters who play a variety of folk, classical and contemporary music. Elizabeth (17), Emily (17), Martha (15), and Mary (11) have been playing music for a combined total of 39 years. 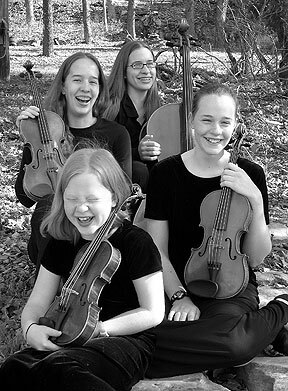 All four are home-schooled and are currently performing in youth orchestras in the North Arkansas area. Emily is also a member of the professional North Arkansas Symphony. The Eureka Strings have been playing together as a group for 3 years now and enjoy working with other music ensembles as well. Their quartet plays music for many different events including: weddings, cocktail partys, holiday events, and all different kinds of social events. They live on Beaver Lake near Eureka Springs and enjoy taking part in water sports, art, karate and outdoor activities in addition to their music endeavors.